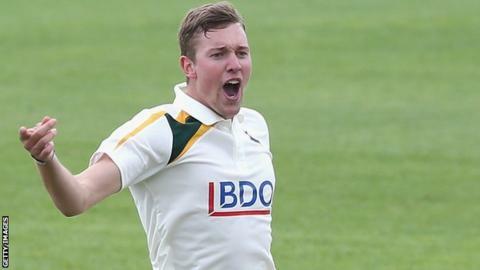 Nottinghamshire seamer Jake Ball has been ruled out for six weeks after breaking a bone in his foot. The 23-year-old was injured while bowling against Somerset at Taunton, his second County Championship appearance of the season. Ball will miss a large chunk of the T20 Blast competition, which gets under way for Notts on Friday 16 May. "Losing Jake is going to leave a hole in our Twenty20 plans," said director of cricket Mick Newell. "He would have featured heavily. I'm disappointed for him and I've got some planning to do to mitigate his absence."